Well, it was just a matter of time – but as the parent of a toddler in daycare I now find myself in need of classroom valentines! Luckily, for those of us that don’t want to rely on drugstore options, Minted has a great line of personalized photo and non-photo classroom valentines (including some with metallic foil! ), there are a bunch of great printable options on Etsy, and some of my favorite stationers have even begun releasing their designs in mini versions! Since I was on the hunt myself, I figured I’d share some of my favorites here with you – and there are a few more options right here! 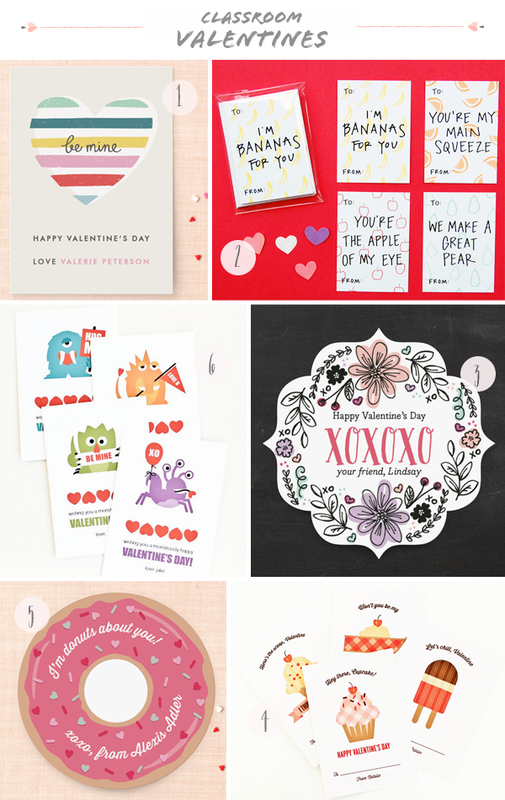 I’m a HUGE fan of Oh So Beautiful Paper – so I’m insanely happy to see my Valentine printables on this fabulous list! Thank you, thank you! Thanks so much for the feature! we are honored to be included among such a fantastic collection.